A structure fire is a fire involving the structural components of various residential buildings ranging from single-family detached homes and townhouses to apartments and tower blocks, or various commercial buildings ranging from offices to shopping malls. This is in contrast to “room and contents” fires, chimney fires, vehicle fires, wildfires or other outdoor fires. The Ebbetts Pass Fire District was formed December 7, 1964, to provide structural fire protection during the winter periods when the local California Division of Forestry station was not staffed. The Ebbetts Pass Fire District became a legal entity, certified by Mr. Frank M. Jordan, Secretary of State for California, on July 26th, 1965. Back then, Ebbetts Pass Fire District provided volunteer winter fire protection and with the same volunteers, received paid fire assistance from CDF for summer fire protection. 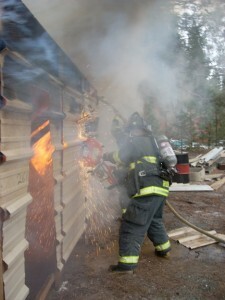 Today Ebbetts Pass Fire District provides complete fire protection year round. Structure fires within the Ebbetts Pass Fire District typically have a response from the Fire District that can include fire engines, the water tender, rescue squads and utility vehicles, chief officer’s vehicles, EMS ambulance units, and the ladder truck, each of which will have specific initial assignments. The actual response and assignments will vary from incident to incident. It is not unusual for Ebbetts Pass Fire District to have a pre-determined mobilization pre-fire plan for when a fire incident is reported in certain structures in the initial response areas of each station. 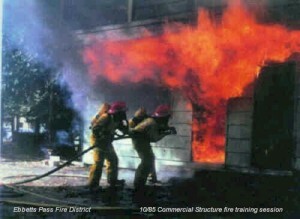 It’s not all “Backdraft” or “The Towering Inferno,” and firefighting remains one of the most dangerous jobs on earth. Any day the firefighters of Ebbetts Pass Fire District can be called upon to crawl into a world of extreme temperatures, suffocating blackness, and deadly gasses. Despite the danger, men and women accept the call to duty, responding to help day or night. Trained in the latest in fire attack strategy and tactics, and equipped with the best apparatus and tools available, the Ebbetts Pass Fire District firefighters respond to all types of fires, including structures, vehicles, dumpsters, and wildland. The number of incidents far exceeds the number of actual fires. Many are out upon arrival, or simply good intent incidents. Some are smoke checks for legal burning while others are false alarms. 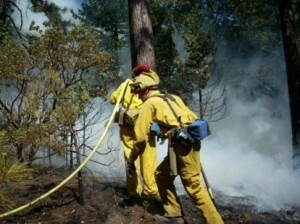 Each one, however, requires a rapid, professional response from each member of the crew. Ebbetts Pass Fire District is an all risk emergency response agency.